The Poco F1 smartphone comes with a liquid cooling technology. The company claims that there is a copper pipe inside the phone that helps keep the CPU cool during intense usage sessions. Xiaomi has pulled the covers off of the Poco F1 smartphone which is now the world's cheapest phone with the flagship Snapdragon 845 processor. Poco is a new subsidiary of Xiaomi and the Poco F1 is its first smartphone launch. Apart from being a powerful phone which does not burn a hole in your pockets, one of the highlighting feature of the Poco F1 is the Liquid Cooling technology that is claimed to keep the device cool even when the user is in intense usage sessions. Xiaomi announced that the Poco F1 will be manufactured in India and will be accepted at all 1000 service centres across the country. The Poco F1 will be a Flipkart-exclusive device. The ecommerce platform has made a special page for the smartphone just like it did with the Mi A2 on Amazon. The phone is available in three colours: Graphite Black, Steel Blue and Rosso Red. There is a special Armoured Edition of the Poco F1 which is made with Kevlar aramid fabric. The same material is used to manufacture space suits and there are red accents around the camera in the special edition model. The Poco F1 is offered in three variants 6GB RAM + 64GB storage for Rs 20,999 and 6GB RAM + 128GB storage for Rs 23,999. The 8GB RAM + 256GB storage version is priced at Rs 28,999 and the special Armoured edition with 8GB RAM + 256GB storage is priced at Rs 29,999. HDFC Bank Credit and Debit cards consumers can avail an instant discount of Rs 1,000 effectively bringing the price down to Rs 19,999. The phone also comes bundled with a Rs 8000 worth of instant Jio benefits and upto 6TB of high-speed data. A super soft case wil be included in the box. The phone will be available on Mi .com and Flipkart at 12 noon on August 29. Although most of the specs have been outed in teasers, Xiaomi officially confirmed that the smartphone runs on the Qualcomm Snapdragon 845 octa core processor. As mentioned, the smartphone comes with a Liquid Cooling technology which is essentially a copper pipe inside the phone that helps keep the CPU cool during intense usage sessions. The smartphone sports a 6.18-inch Full HD+ IPS LCD display with a resolution of 19:9. There is a wide notch on the Corning Gorilla Glass protected display because the phone has an IR lens to make the face unlock more effective in the dark conditions. The notch has a lighting sensor, earpiece, a 20MP camera and a proximity sensor housed inside it. The bezels on the sides are nominal and there is a thick chin at the bottom. 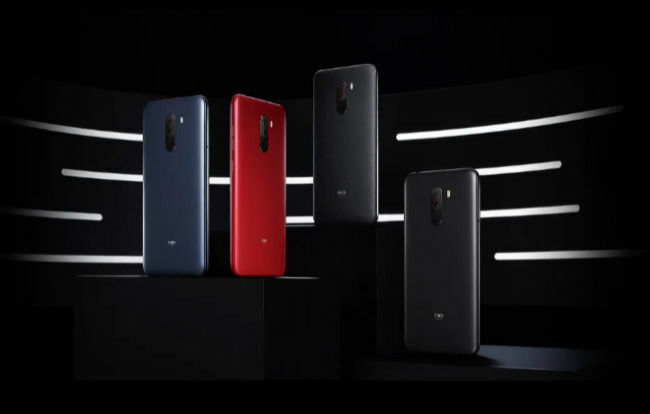 The company skipped the glass back and manufactured the Poco F1 with a hard coated polycarbonate unibody with made using a layer colour process. The reinforced internal frame structure imporves the feel of the phone in hand, calims Poco. 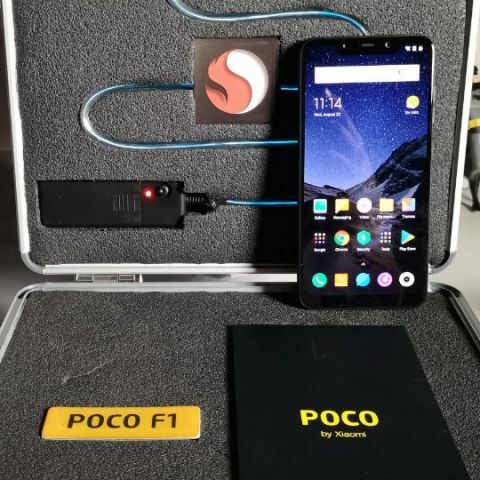 As mentioned before, the Poco F1 smartphone is offered in three variants, 6GB DDR4 RAM + 64GB UFS 2.1 storage, 6GB DDR4 RAM +128GB UFS 2.1 storage and 8GB DDR4 RAM + 256GB UFS 2.1 storage. Buyers will have an option to expand the memory up to 256GB via a hybrid slot. Further, the phone houses a 4,000mAh battery which can be charged by a USB Type C port. The smartphone comes with Quick Charge 3.0 technology and a fast charger in the box. Xioami claims that the smartphone can deliver upto 8 hours of gaming. When it comes to optics, the Poco F1 has a dual camera setup at the back: The primary camera is a 12MP Sony IMX 363 lens with f/1.8 aperture, dual pixel PDAF technology, Real Time AI photography for scene recognition with the ability to recognise 209 scenes in 25 categories, AI backlight detection, portrait mode and HDR. The secondary camera has a 5MP sensor. Xiaomi opted to skip the Optical Image Stabilisation (OIS) feature. On the front, there is a 20MP lens with Pixel binning technology, Portrait Mode and HDR. There are two speakers for the surround effect. While one is located below, the other one is on the earpiece. Both the speakers have a Dual Smart Power Amplifier with Dirac HD Sound. The Poco F1 runs on Android 8.1 Oreo with a new "MIUI for POCO" skin. "MIUI for POCO" comes with the Poco Launcher, an App Drawer, and customisation options. The app drawer looks pretty similar to stock Android, with the exception of the Search Bar at the bottom of the display. The UI group apps automatically by type or by colour. There's also a new Hidden Apps feature which allows users to hide apps and lock them by swiping twice from left to right. The Poco Launcher Beta will be available on Play Store from August 29. Xiaomi claimed that "MIUI for POCO" will bring up to 28 percent faster app boot up and 22 percent faster animations than other popular OSes. "MIUI for POCO" dedicates the system resources to the apps running on the foreground which results in a better gaming expereince. Xiaomi promised that it will rollout security updates for the Poco F1 at least once in a quarter. Which is the cheapest smartphone available in market ? which is the cheapest android smartphone of 2014?